Not all windows are made the same. If you have unusually shaped windows, finding the perfect window covering can be difficult. At SelectBlinds Canada, we let you customize your window coverings to fit many shapes and sizes. With this handy list, we’ll help you to choose the perfect blind or shade for your unique needs. Contact us at 1-888-685-1735 or service@selectshops.ca if you have questions, need measuring tips, or are ready to order. 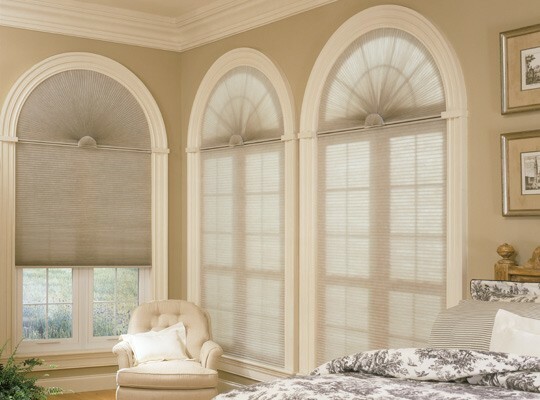 If you have half-moon or eyebrow-shaped windows, our arched window coverings will give your space the finishing touches for a streamlined look. Our wood shutters will complement your décor and coordinate with any other window coverings you may have. To meet your individual needs, you can choose from a stationary, moveable, or top down/bottom up option. These options are also available for octagon and trapezoid-shaped windows. While shutters are classically used to cover square or rectangular windows, they can also be fitted for other window styles. Our specialty shutters are available for octagonal, arched, circular, and rake style windows. 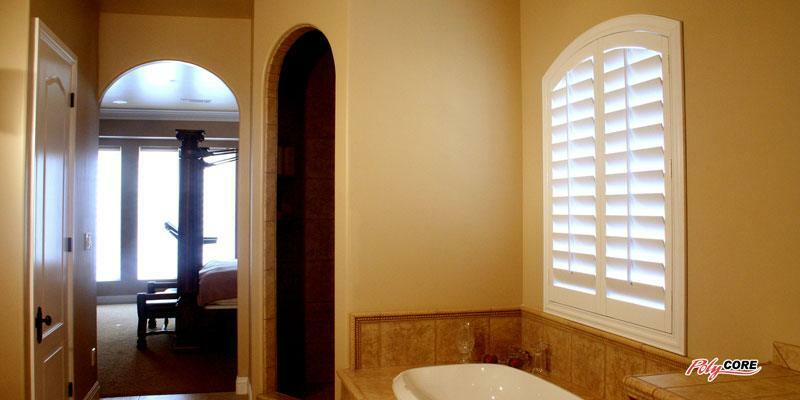 In addition to specialty window shutters, we also offer shutters for your doors. Since our specialty shutters are made from wood or polycore (with an aluminum core) materials, they’ll be durable and long-lasting. Skylights are a gorgeous feature which adds warmth and light to your home. But while they may look stylish, they can let in unwanted excess sunlight, as well as heat and cold. 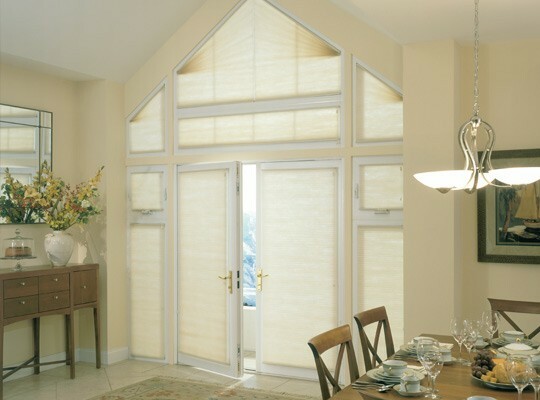 Available in light filtering and blackout options, cellular shades can add insulation during the cold winter and hot summer months. They can be customized to fit angled and curved windows, so you won’t have to deal with bright sunlight when you don’t want to. 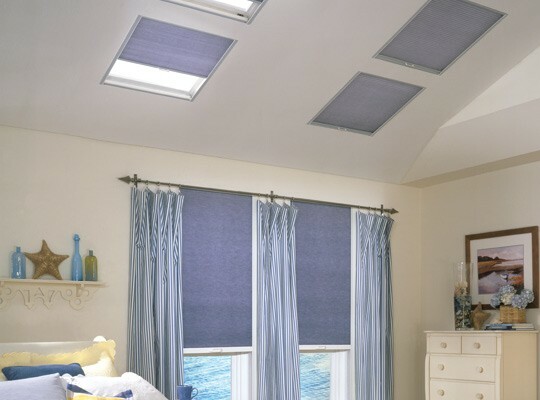 Opening and closing your skylight shades will be simple easy-to-use track system. If your skylight is hard to reach, an optional expandable pole or motorization option can be added so you don’t have to worry. If you want window coverings with the best insulation for your large windows and doors, ovation cellular sliders are for you. With no exposed cords or wands, the sliders are not only child-safe, but also easy to operate. 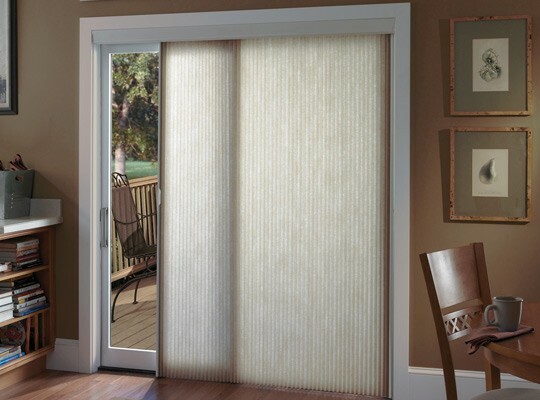 They are available in light filtering and blackout fabrics to allow you to choose the ideal amount of light you want entering your home. With several stacking options, the ovation cellular slider will look good no matter what your style. Large windows and sliding doors can be beautifully and easily covered by sheer verticals. 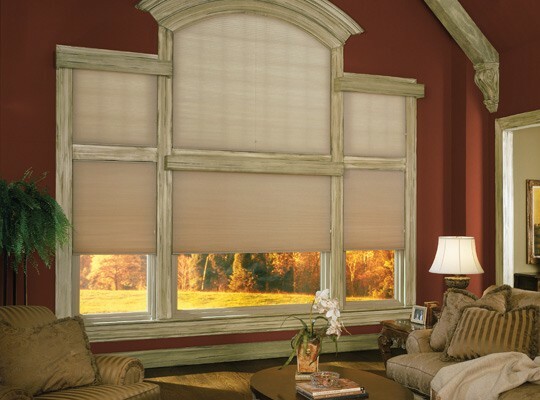 To customize your blinds, choose from light filtering or room darkening options. Several stacking options and colours are also available to create the look you want.